TO YOUR CLASSROOM . . . THE PERFECT IN-SCHOOL SCIENCE PROGRAM! OH NO! ARE YOU IN A SCIENCE QUANDARY? 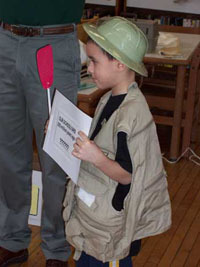 THE PROBLEM: Your teachers love the hands-on science programs provided by museums, zoos, and other area institutions. But, the costs are becoming prohibitive. Bus fees, programs fees and fuel costs are increasing. Plus, there's the hassle of field trips, permissions slips, finding substitutes – not to mention hauling tubs full of bag lunches and backpacks. THE SOLUTON: Natural Discoveries, the new science education company that brings hands-on science programs TO YOUR SCHOOL! NATURAL DISCOVERIES TO THE RESCUE! Bring new excitement into your science curriculum with a program from Natural Discoveries – the science adventure company. We come to your classroom with unique life and earth science programs that blend hands-on learning with a healthy dose of fun to get your students excited about science. Meet live animals, handle museum-quality artifacts, join interactive demonstrations, peer into the micro-world, and more while learning about the fascinating world around us! Each program is correlated to the Colorado Standards for Science Content and is targeted to specific grade levels. Our approach is activity-oriented and inquiry-based. 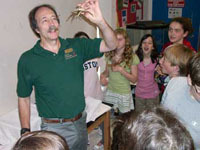 Our goal is to help “turn on” students to science and the natural world! HAVING FUN as they learn!